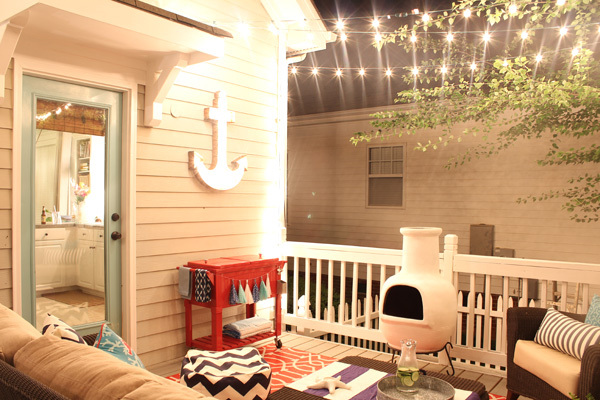 Day or night, this cozy deck is the place to be. Plush furniture and an outdoor rug maximize comfort, and string lights cast a warm glow. 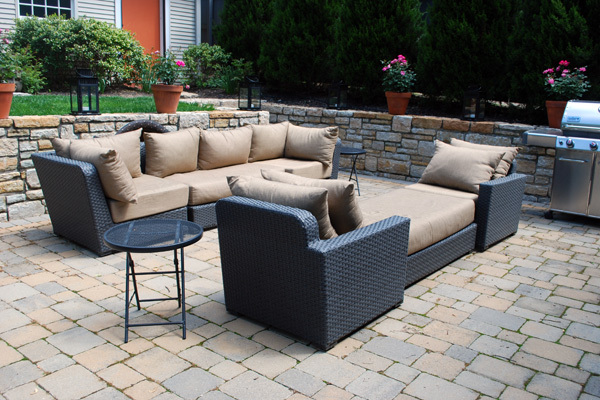 Make sure your outdoor seating is as cushy as your indoor furniture. Today’s outdoor cushions aren’t the plastic-y, sweat-inducing pillows of the past. Plus, they can handle a downpour and spring back once they dry. Lay down outdoor rugs so you’re just as comfortable barefoot as you are inside. Give yourself some privacy. Create natural screens with shrubs, bushes, or even bamboo reeds. Or install prefab screens from your local home improvement store. Our devices and electronics have conspired to keep us on lock down. Since we’re not about to chuck our digital toys, boot up your outdoor space so you can keep texting, posting to Instagram, and watching cat videos. Wireless outdoor Wi-Fi antennas provide an extra boost so you can stay connected. A solar USB charging station keeps your gizmos powered. Wireless speakers make it easy to bring your music outdoors, and mask a noisy neighborhood. An all-weather outdoor TV lets you stay outside for the big game. Creating a seamless transition between your home’s interior and exterior isn’t as simple or low cost as adding comfort, but it’s the most dramatic and effective way to enhance your enjoyment of the space. Plus, it can increase your home’s value. The most straightforward, cost-effective solution: Replace a standard door opening with sliding or glass French doors. Use the same weatherproof flooring, such as stone tile or scored concrete, outside as well as in the room leading to your backyard oasis. When the sun goes down, don’t be left groping for your wine glass. Outdoor lighting dresses up your home’s marketability and appeal (exterior lighting is buyers’ most wanted outdoor feature, according to the NAHB study), makes it safer, and lets you spend more time outside. Use uplighting to highlight trees, architectural details, or other focal points. Add sconces or pendant lights to make evening entertaining, grilling, and reading easier. 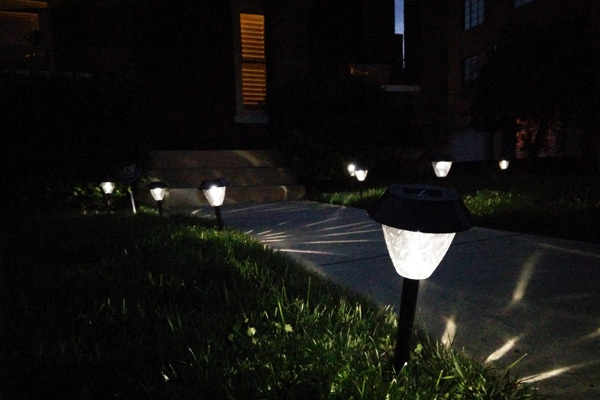 Illuminate walkways, rails, and steps with landscape solar lights. Hang fairy or string lights to set an enchanting tone. Let your style dominate your backyard space. Paint a faux rug with your favorite colors. 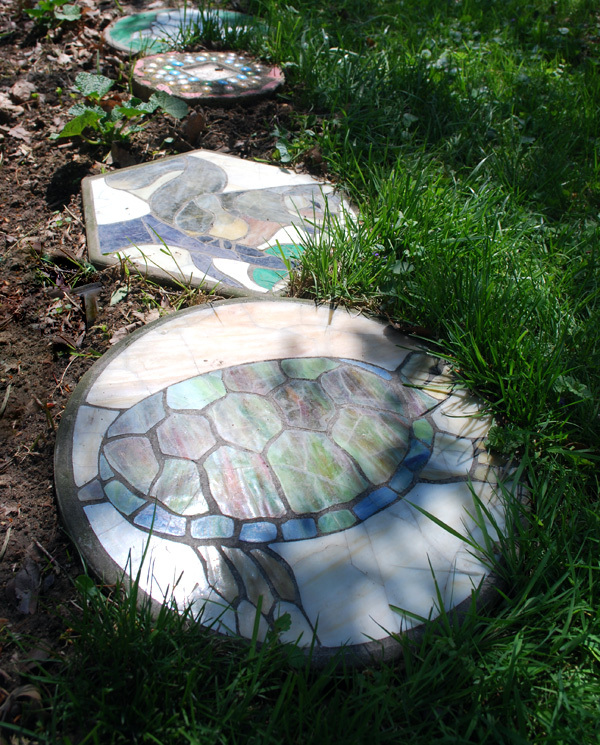 Create a path made with colored glass, brick, or other interesting found materials. Craft a one-of-kind outdoor chandelier. Build a pizza oven, custom seating, or other feature you crave. Add personal décor that makes you happy. In fact, make your outdoor retreat an ongoing project where you can hone your DIY skills. Your outdoor space will magnetically draw family and friends if it has features they find appealing. A fire pit is a proven winner. Food and fire have brought humans together since the dawn of time. 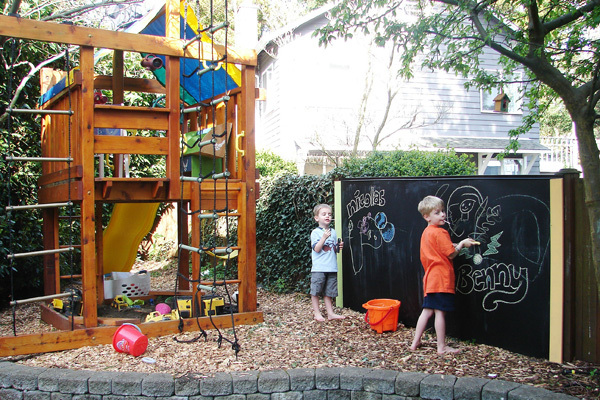 Give wee ones the gift of magical thinking with an outdoor playhouse. Add whimsy with a chalkboard fence that both kids and fun-loving adults will enjoy. Add a doggie window in your fence to entertain Spot. Installing a dog run may even boost your home’s value. FYI: It’s been said that pets are one of the top reasons why people buy houses. 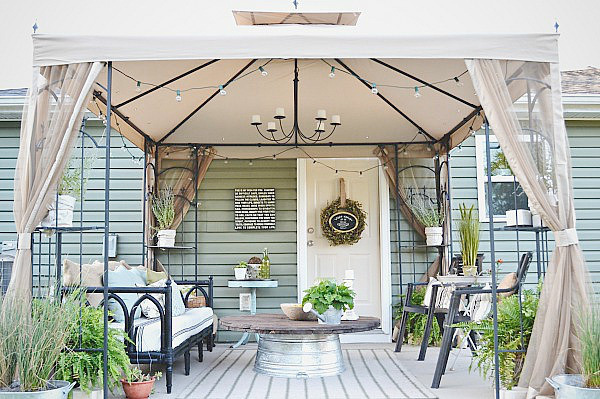 Install an awning, canopy, or pergola. It’ll make it easier to read your Kindle or iPad and keep you dry during a summer shower. Look for products with polycarbonate panels, which block UV rays, too. Rig glass fence windscreens to the keep your BBQ fires burning.